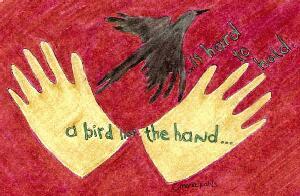 "A bird in the hand... is hard to hold!" oh yes, stephen kent & i have been trying to come up with a way to combine the gallery with the corresponding issues of the newsletter. back when we first posted the images things were pretty jumbled and i was having him post images in gallery pages weeks after they were discussed in the newsletter... it wouldn't surprise me to mention something in issue 47 and finally get the image shown in gallery #53,that's just how it went. so in the months to come you may notice some pages missing or some images scattered around that you aren't sure belong where they are shown, just know that we are working on it and we appreciate your patience as we make sense of all the work we did last year. after all some one has to keep you on your toes! and it might as well be me! "Believe me Maria, when I say that the Primitive Pals is and has been a growth for me... participating in swaps has gotten me to the point where I am making my own patterns with more self confidence... When I reflect on it, it has the same feeling for me that I get after completing a course/class. I feel like I've learned a lot and I'm still learning but I'm also applying what I have learned. When you are in high school or college, you learn the basics and go on to the next level... and you know that you still have more to learn... in this instance, it's like a self-study program... the information is given out constantly and then it is up to me to incorporate this data into my doll making... and there is still more to learn. It's pretty thrilling because I'm learning about my own creativity. I'm very thankful for you and this group! " "What a wonderful "midsummer's day" to visit the Sheep and Wool Festival in Friendship, Maryland. This was the second day of the Festival and HUNDREDS of sheep, goats and rabbits were on display -- i guess they were musing at the THOUSANDS of two-legged animals that came to gawk, exchange funny green paper (which the goats considered "snacks") -- for THEIR very own wooly coats! not to mention the horror of watching these two-legged critters gobble down their "family and friends" on buns topped with ketchup! -- and all of this was being done in a town called "FRIENDSHIP"! Well, I did my "humane" part by only eating "veggie pizza" and the only thing I bought was SHEEP POOP! (THREE BAGS FULL: one for my master (me), one for my dame (my daughter) and one for the little girl who lives down the lane (my friend Cyndi)! AND I ALMOST bought the SHEEP to go with it! -- but realized that "I" would be the one that had to "scoop the poop" -- so decided against it! However, -- there was a man who was making "hand-crafted" brooms -- and the floor was piled high with "leavin's" -- looked like DOLLY HAIR to me! And I overhead him tell someone that "even the sheep won't eat it." So I inquired about it -- and he said, "honey, if you can find a bag big enough -- you can have ALL of it!" A man in the next booth was "guffawing" at the sight of me sweeping this guy's booth space -- and the broom-maker said in a loud whisper (AND SHE ACTUALLY OFFERED TO "PAY" ME FOR IT!) Hmm.. how about a "Little Bo Poop" doll ... stuffed with ... you know what!" " Frannie Morsherer was there with a bunch of her group, as well as other doll makers from various on-line doll groups in the NE part of US. Frannie had quite a collection represented of her primitives. One was a wonderful bee lady doll I fell in love with. 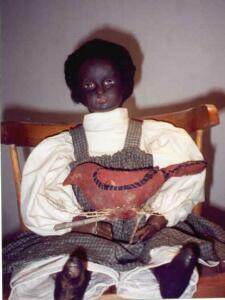 The doll was a big primitive doll, wearing dress hand painted in a black and yellow stripes. She carried a baby bee dangling in her arm. She had cute legs and shoes, and I wish I could remember more! Other highlights included a class taught by Mimi Winer. And the event included patterns to buy as well as wool for hair, trims, doll pins, etc. Then we all had to create a tiny doll pin using scraps of fabrics handed out. Frannie created this little fairy creature -- or course! -- holding a leaf as an umbrella. It stood up just like one. until later in the day. It started drooping. Frannie claimed this was because it had stopped raining! Nancy Gibbs made a tiny jester, complete with a tiny tear on his cheek as though he were crying. Then she pinned it on my shirt. It is so dear... We had a blast, and the thought that all of us just "came together" from the doll lists was great." See the Shari Lutz Interview in this issue. Visit the Shari Lutz Catalog Page on Homespun Peddler. Crooked Tree Hollow is located in the forest so the sun does not shine for LOTS of hours in my gardens-- so ivy (including POISON! ), ferns, evergreens, holly, dogwood, mountain laurel and all things GREEN carpet the forest floor. I have created a "secret garden" where children visit during my "Yesteryear's Children" historical tea parties. At Victorian Tea Parties, I hand-write poetry and color soft flowers on cards and tie them to the lower branches of trees with silk ribbons. When a birthday celebration is held, the children each untie a friendship poem and read it to the honored guest and then present it to her. This is my way of showing children that gifts do not always have to cost money -- something as simple and lovely as a poem can create forever memories ... and friendships. "My garden border: The garden path is lined with old brick and plantings include: lavender, yarrow,old english roses, 'money plant', columbines, 'johnny-jump-ups', lamb's ear, purple cone flowers, black-eyed susans, shasta daisies, and a few that are unknown to me. A nicely rusted rabbit from an old weathervane can be seen "running" through the flowers. I'm always looking for something to add such as an old bench that would be home to several aged watering cans. As for my love of the garden and for any knowledge I have of plants and flowers, I give credit to my mother for dragging me to nurseries and flower shops when I was young. She had the most gorgeous flower beds utilizing every area that she could to plant. I didn't realize how much I did know until I got older. She has now passed on, but many of her plants still live on in my flower beds. I think that is a suitable tribute to her. " i have hopes some day that my gardens will be as nice as they are in my dreams! right now they are sort of "hodge podge" but there are some great plants scattered about. one favorite,the poppy,with its brief moment of glory lasting a mere day... it goes on to become a great dried pod that i use for lots of stuff. some of them i even sow thickly so that the plants wont develop to full size and i get great tiny doll size poppies... a variety of herbs,ground covers and wild flowers,with an emphasis on plants that attract humming birds and butterflies. i have one gawky scarecrow made from an old bed post with twig arms and a tin hat band & bow tie. another border has lots of little stones that i've collected during my traveling days and a butterfly house my husband crafted. another area blooms with millions of forget-me-nots and quite a few foxgloves in the spring. little animal statues are nestled about and i have a wooden trellis over the walkway which i trail various vines on from year to year. nothing too fancy, and it all really needs work! where's those gloves? sl: I started about 9 years ago making Father Christmas dolls, hand sculpting the face, hands and boots, and making a lot of my own toys. In addition, I enjoy haunting flea markets, antique malls, and thrift stores for fabrics, trims,and laces, or toys, antique children's books. What started out as a favor 9 years ago to a friend, has grown into a full time business for me. I find a lot of joy in creating my dolls, and especially selling to collectors who have followed my work for all these years. More recently I have started a folk art style santa that I am quite excited about, his is a more aged, primitive appearance. In addition,folk art rabbits, little ol' herb ladies, angels, witches, and dolls, all filter into the mix. I also enjoy working in papier mache', and have started making witches, Halloween "rattles", and Halloween replica cloth painted candy containers. pp: many would be interested to know about your interpretation of the Izannah Walker (see issue 44) style dolls that you make. what can you tell us? sl: I started trying to reproduce my version of the Izannah Walker Style dolls about 3 or 4 years ago, in between Santa making. It took a long time to get to the point where I have gotten with the doll, lots of pattern revisions, size changes, research, research, research. 1998 has gotten me the closest yet to capturing the doll, and I introduced an aging technique lately to the dolls which helps them to really seem as though they are very old. They range now in size from 19" to 28", my favorite being the smaller size. I tried to duplicate the old "off the shoulder" look to the white dolls, and a more folky looking dress for my black children. I create the faces for these dolls by doing an original sculpt, which I place fabric over, and then go on with layers and layers of coating and aging techniques. They are very time consuming, and mostly a labor of love. At times they are even difficult to part with. This year (1998) an easy version of my technique was printed in Cloth Doll Magazine. pp: where do you get your inspiration for your dolls? sl: I love anything old and living in Lancaster County PA one has access to a lot of antique malls. I especially love the old cloth dolls, but cannot afford them. Next best thing was to reproduce them myself. Right now I have other antique cloth doll versions in the works. I collect the Antique Doll magazine, any and all doll books and reference books that have any antique-y primitive looking cloth dolls. sl: I have been making dolls of one sort or another for about 25 years. 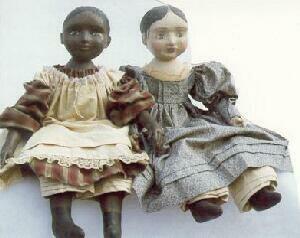 I have always loved the primitive dolls, and dolls that seemed to have first been made 100 years ago. So that is why the "Izannah dolls" and now my latest cloth rag style dolls. I have a feeling my santas are now evolving from the look I have had for the past 8 years into a more primitive, folky look. As to my cloth dolls, they are continuously evolving, and I think Primitive Pals/ the seed pod has been the drive behind some of my latest ideas. My favorite dolls are the more primitive style dolls, I am drawn like a magnet to booths that carry them at the shows I do. However, I myself haven't done much in that style for shows yet, but am planning to start to introduce more as time goes on. I have a lot of new things on the drawing board, and a few ready to dress. I rarely keep things for myself with the exception of those which have won awards. I take great joy in filling orders and selling my things to the people who love them. See the Burlap Sack resources section for more information. See the letter Shari Lutz Interview earlier in this issue. the best water to use in your iron is distilled. regular tap, mineral, or spring water can build up deposits that clog the steam holes. check manufacturer's directions but most irons can be safely cleaned by filling the reservoir with a mixture of white vinegar & water. then expelling the liquid by selecting the hottest steam setting and ironing an old thick towel. linsey woolsey an old style cloth that was originally woven with a linnen warp and a woolen weft. Up until a few years ago you could purchase this fabric new from the Scarlet Letter, a mail order company that specializes in reproduction sampler kits and related items. See the Shari Lutz Interview earlier in this issue. Mail order business for reproduction historical needlework kits, related materials, books and accessories for sale. They also sell antique samplers. this is out of print so visit your library. hard to find varieties of poppies.